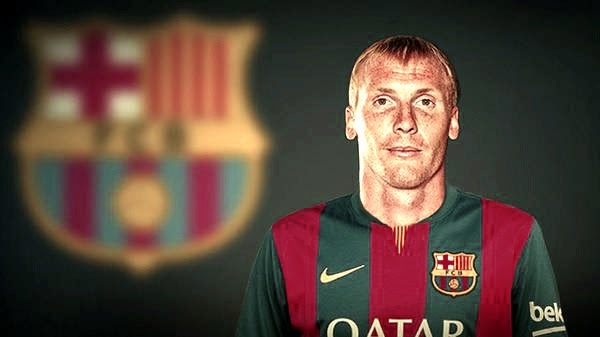 Barcelona Football Club has announced the much awaited signing of defender Jeremy Mathieu from fellow Spanish Club, Valencia. The transfer of the French national was stuck up for sometime with dispute arising about the final fee and the way in it will be structured. But finally it looks Barca has succumbed to Valencia's demand and agreed to pay €20 Million. Jeremy Mathieu, who has been a pretty known face in La Liga was one of the best performing defender in last season. He usually plays in the left-back role, but did really well when he was shifted to the center back role last season. With this signing FC Barcelona have finally started to take steps to improve the defensive situation associated with the team. We may still need a number of signing as the sword of transfer ban is still hanging on our head. FC Barcelona has announced that La Masia product Bojan Krkic will be joining English Premier League club Stoke City this coming season. Bojan Krkic is expected to sign a four year deal with the English Club. This will be the start of yet another chapter in his footballing career which has gone sideways more than going forward. After Pep guardiola deemed him surpless, he has tried his luck with Roma, Milan and Ajax. All of them failed miserably. Let's hope at Stoke he is able to get his career back on track. 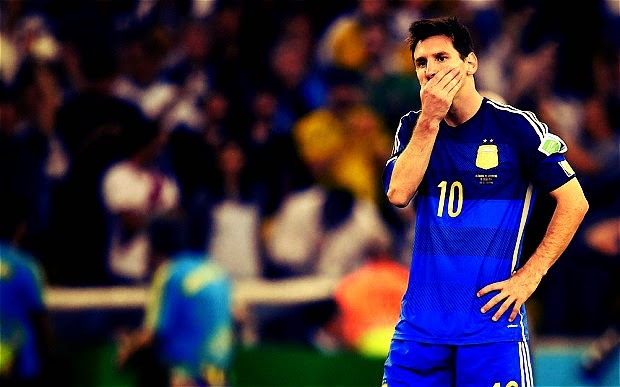 World Cup Finale Failure may Haunt Lionel Messi this Season! This will be tough, even for a person like Lionel Messi - who to his credit keeps his emotions under check at most of the situation. After losing the final it was clear that he never wanted to spend anymore minute on the pitch. But he has to. He was the losing Captain! His colleagues, many who towers him in size couldn't hide their tears. Aguero, Mascherano, Garay, Demechelis all were crying like little children but not Lionel Messi. There was disappointment in the face but no tears. But one look in to those eyes told a different story. Inside we were crying, screaming, breaking down; but still presented an emotionless face. It didn't end their! He has to make that long walk up the stairs twice - first to collect the Golden Ball Award, then to the mandatory medal for the losing team. It was too cruel! This has to be Lionel Messi's moment of reckoning - the chance to permanently etch his name among the pantheon of the greatest in football. Frankly he don't have to win the World Cup to be considered as one of the greatest of all time; but then some people just wouldn't shut up. So a victory tomorrow night in the final of the greatest competition in the footballing world will silence the critics forever. Or at least for sometime! You cannot judge the greatest players of teams on what they won. In that case the greatest Dutch team ever featuring Cryuff wouldn't make the list. That would be a tragedy. The bigger tragedy would be thinking the likes of Italian team of 2006 or the Brazil of 1994 making the list because they won the damn thing! The same with players. The greatest should be judged on whether they have revolutionized the game or not. In that simple criteria, Messi made the list a long time ago. FC Barcelona have announced that the club has reached an agreement with Liverpool for signing Uruguayan striker Luis Saurez. The club will be paying €88 Million for signing the controversial striker, who won't be allowed to play any kind of football till the end of October. FIFA has already rejected Luis Saurez appeal against the sanction which was for biting Italian Chiellini. Barca fans are divided about the signing of the controversial striker, but for the time being the Club has looked to other way about Saurez's controversial on-field behaviour. He will travel to Spain next week for the medical and signing a five year long deal. He will be wearing the number 9 shirt at Barca. You all may have forgot that we had a player named "Isaac Cuenca". It's easy to forget isn't it? Especially when the player missed the majority of season through injury. Now at least he gets to put his career back in shape at a different team where importantly he would get playing time. Isaac Cuenca has joined Deportivo La Coruna on a free transfer after FC Barcelona decided to cancel his current contract. He has been not in our club's plan for a long time and should have been released last season itself. Even though it was late, the club did the right thing by releasing him for free. All About FC Barcelona wishes Isaac Cuenca all the best for his budding career and let he take the La Liga by Storm once again. Arsenal has officially announced the reaching of an agreement between FC Barcelona and themselves for the signing of Star Chilean forward Alexis Sanchez. The deal will fetch FC Barcelona €42 Million Euros, a substantial part of it would be as incentives. We are not yet clear about the fine print, but the initial rumours are we will be paid €30 Million in cash and the rest as incentives which are rumoured to be easy to achieve. 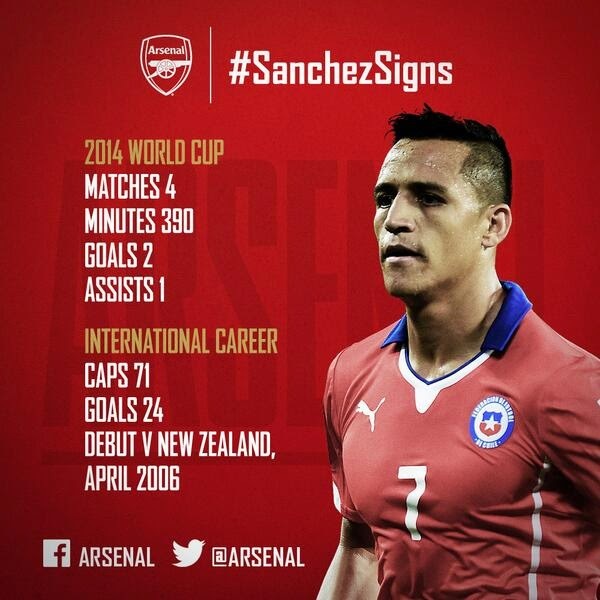 Alexis Sanchez was signed by Barca from Udinese in 2011 for a deal with total to €38 Million. Now, selling him for €42 Million sounds like a brilliant deal; especially considering that the player never had the desired impact at Barca. His stocks rose after a brilliant World Cup and Barca may not find a better time to cash on him. Finally it will happen - Jonathan Dos Santos will get a chance to do other things than twitter updates. Yes, you heard it right - he decided that he has time left to play football and decided to join Villareal. I was one of the few who was delighted to see him stay last season. But an injury and general reluctance by Tata Martino to use youngsters saw him doing nothing other than social media updates. In one of my previous post 5 Player's who could leave Barca, I have mentioned why he needs to leave this summer itself. Al least he heeded the advice and acted quickly. From what I have heard, Villareal will pay 1.5 Million for the player. There is a bonus of 0.5 Million in the deal which will be paid if Villareal make it into the Champions League next season. It is not clear whether the 0.5 Million is included in the 1.5 Million or additional to it. 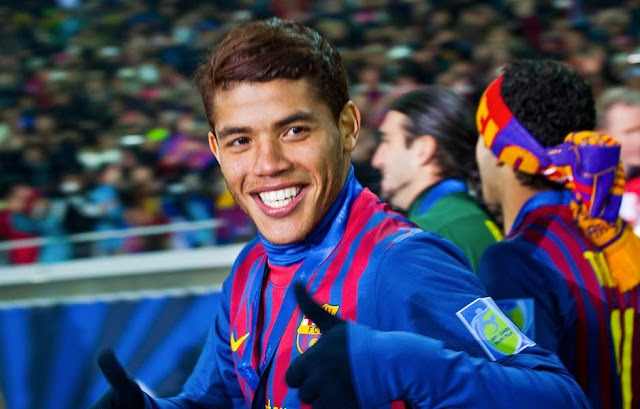 At Villareal he will be joining Giovani Do Santos, his elder brother - who actually got his career back in shape with a spectacular season with Villareal. These two players are so crucial for the Mexico national team future and hope they fulfill the promise and become a strike force in itself. With a confident 1-0 victory against the Belgians in the Quarter Finals, Argentina has surpassed a huge mental barrier on its own - The Quarter Finals. A look at the rich Argentinian history at the World cup shows that the two time World Champions have stumbled at the last eight more often than any other country. From 1986, when the knock-out stages were officially introduced as we have now, Argentina have exited three times at the Quarter Finals. The two times they managed to get past their Quarter-Final opponents, they have managed to reach the tournament finals. Now that's a nice statistics to focus as Argentina needs a lot of history to back them up when they meet the Dutch on Wednesday. Since the 1990 World Cup, Argentina has never managed to go beyond Quarter Finals. In that sense this team has already succeeded where many of its illustrious predecessors failed. 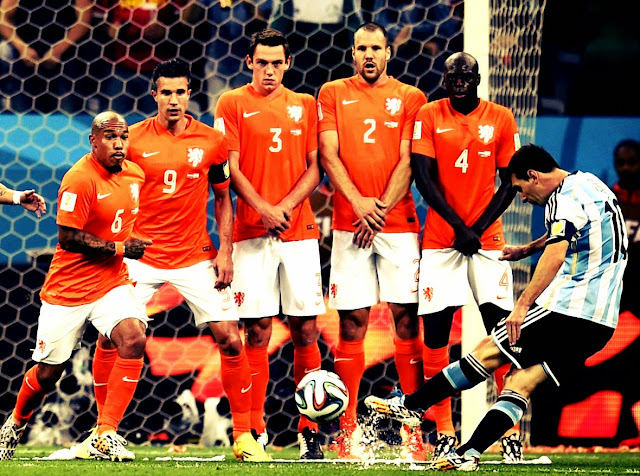 But then for this team led by the Mercurial Lionel Messi anything short of the ultimate triumph is a disaster. Quarter-Finals, that has been quite a dreaded word in every Argentinian football fans dictionary for some time! There is rather good reason for it too. In three of the last four tournaments they featured, they made unceremonious exit at this stage. 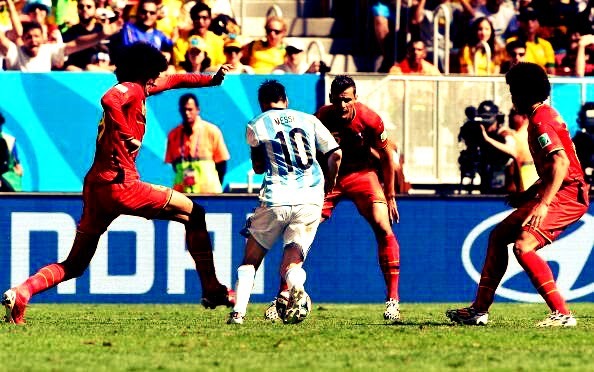 And funny Messi was an integral part of all the three. In 2006, José Pekerman's decision not to bring a young Messi drew huge criticism and it's safe to say that it resulted in their exit. In 2010 World Cup it was Messi's inability to inspire his team which resulted in an absolute thumping at the hands of Germany, which also took the only entertainer in the competition, Diego Maradona out of sight. The case was no different in 2011, even though Tevez was one who missed the penalty; Messi's lack of effectiveness was questioned as Argentina failed to make a fist of the challenge thrown by eventual champions Uruguay. 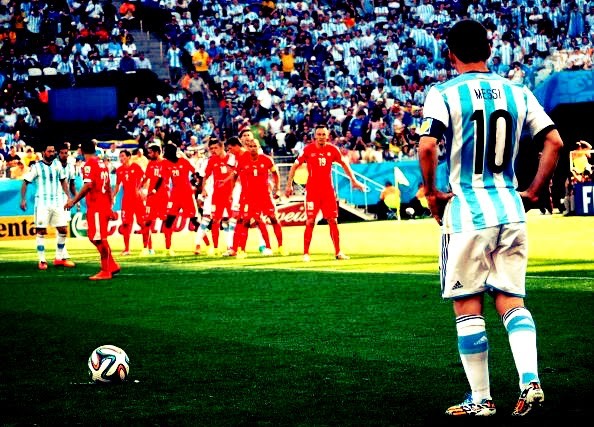 So yet another Quarter Final beckons; a chance for Lionel Messi to correct a lot of wrong! 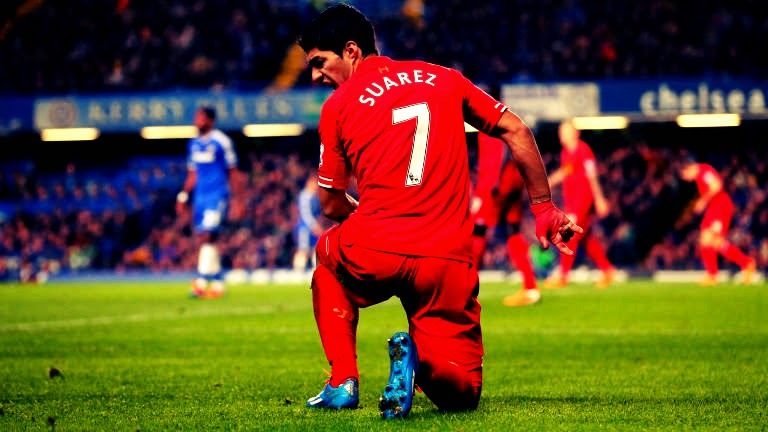 4 Reasons Why Luis Suárez Transfer is Bad for Barca? Rumours have become strong about the impending transfer of Luis Saurez to FC Barcelona. FC Barcelona is rumoured to have come to an agreement with the Striker for signing a 5 year Deal. Finally Luis Suárez issued the much awaited apology for the disgraceful biting incident; it came after a lot of denial, strange excuses and may be even fooling the entire nation to stand behind him. For those who watched the incident (even in real time) there was no doubt about what happened on the night when Uruguay dumped Italy out of the World Cup; unless you were an Uruguayan! It was quite a disgraceful incident and the history of the player suggests that he is a walking danger to fellow players on the pitch. One could argue that his early struggles in his life are the reason for such a volatile character; but for the assaulted player that is not any reason for comfort. The inside story about the sudden U-Turn by the player may have a FC Barcelona dimension to it. Considering just days ago even the President of his country openly supported him, the apology came a bit too early. Am not sure how his supporters should feel about this? After all they were the only one who believed his story of "Losing balance and accidently clashing his face on to Chiellini".